The classic guitar program is very comprehensive. Some say “playing classical guitar we can play anything” . However, teaching guidance is always based on your musical taste. Being the guitar a popular instrument the learning possibilities are almost inexhaustible . 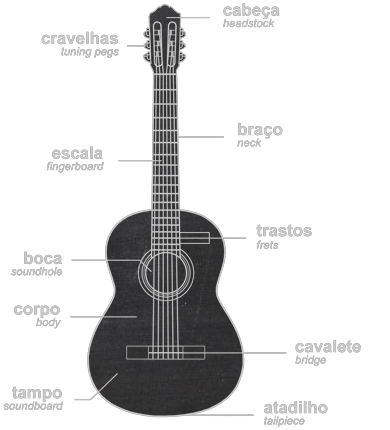 From the classic guitar in the purest sense, going trough Spanish and Brazilian music, Fado accompaniment, folk music, all to be approached as long as you have an open mind and a willingness to learn. The approach I take to an initiated student it’s very similar with all of my students. The bases and fundamentals of the technique are identical so one can not diverge much. The position of the instrument , placement of hands and fingers and posture are key points to succeed . After this first stage, we began to work on independence and coordination of both hands. Here it is imperative to have a constant practice plan for your self-motivation. The program from this point on is very flexible and the teaching materials are given accordingly to each and every student.